Are there any things that you don’t want the other members of your triad to know—or that you don’t want to know about them? I’ve heard first mothers talk about not sharing their birth stories with adoptive parents because those are for the adoptees and for themselves only. I've also heard of adoptees concealing their reunions from adoptive parents so as not to cause them pain. What don’t you want shared in your adoptive relationships? Interesting question and one that I think I'll explore from my 2 sides of the triad. For me the very first obvious thing that came to mind was coming out to Iris, my first mother. We had not been in "reunion" very long, she had been very hesitant to have any contact with me at all and I wasn't sure how she would take to finding out that the little baby she placed for adoption had grown up to be a lesbian. So I did keep that from her - at first. I have been out as a lesbian since I was 19 years old, so the idea of any part of my life being back in the closet just didn't sit to well with me. And in my mind, I was denying a very important part of my life, my partner Hilary, by not being honest and telling Iris about her. So I did tell her. You can read about it here. I never kept my reunion or the fact that I was searching for my first family from my adoptive parents. They had always told me when I was growing up that if and when I wanted to search, they would support me and help me so I took them at their word. Sometimes I have to rein my Mom in a bit and keep her from showing up on Iris's doorstep. I can't think of a single thing that I would not want to know about Iris or anyone else in my first family. Having gone 30 years with 15 lines of non-identifying info as the only things I did know, I thirsted for more. I've kept every letter and every email that Iris has sent me so that I can pour over them again and again, analyzing, dissecting, reading between the lines for every tidbit that I can squeeze out of it. I've even made notes after phone calls on things she has said so that I won't forget them. Because of my experience of growing up with no knowledge of my first family, I have developed the same habits on Liam's behalf. I print off emails, I keep notes, I make sure that anything that I have or know about his first family he will also have and know. And because his adoption has essentially closed, I thirst for more for him too. I tread a fine line of respecting his mother's choice and making sure I have not failed Liam. Again, I can't think of a single thing that I would not want to know - the good, the bad and the ugly. Likewise, I love to share everything about Liam and our family with his first family. I send updates at least twice a year, or more often if something big is going on, like when Liam had his tonsils out. I could not imagine keeping anything from his mother. That being said, I am struggling with how to tell her some things that are going on right with Liam right now. I have the letter half written, I just need to stop procrastinating and get on with it!! It's that fine line again... wanting to share with her but wanting to write things in a way that won't cause her any distress. Be sure to check out everyone else's Roundtable answers to this great question. There is a ton of advise out there for couples – Don’t go to bed angry, be honest with each other, don’t keep secrets, still maintain your individuality, be respectful, communicate, etc..
And while Hilary and I agree with all of that, for us it’s not the secret to our success. We actually didn’t realize how important our “secret” was until we were away on vacation last week and we couldn’t avail ourselves of the “secret”. Our “secret” is in the bedroom and one we that we just couldn’t figure out how to do while staying at my in-laws house. The first few days without it weren’t too bad as we were jet lagged and our days were busy so we were falling asleep as soon as our heads hit the pillow, but by the third or fourth day we didn’t know if we were going to make it the rest of the vacation without it. We started to get a bit grumpy, we weren’t well rested in the mornings and we just couldn’t find our night time rhythm as a couple. We’ve only been home 2 days now, but it has made a world of difference! We were both looking so forward to being home and getting back into the swing of things that even getting home at 01:00 in the morning and not getting into bed till well after 2:00 deterred us from it! And what is this magical secret you ask? Separate top covers for each of us on the bed! I don’t remember when we started doing this, but it is the best advice I can give any couple. Hilary likes a light covering with her feet tucked in. She doesn’t move around much at night, so once she is settled her blankets rarely move. I like 5-6 heavy blankets with the sheets untucked and my feet hanging off the end of the bed. I move around and fidget all night long, to the point that my covers have ended up turning 180 degrees during the night. Before we started having separate covers blanket battles were common. I would roll over and pull all the covers with me leaving Hilary exposed. She would be too hot or I would be too cold. We would frequently wake each other up during the night and no one was getting a very good rest. Now? We have the best solution for each of us and everyone is well rested and happy. After doing a Mother's day spread for the past few years, you would think that I would try to do something equal for Father's day. Alas it is not to be so this year. Not that I don't think fathers are important, they just aren't as prevalent in my day to day life. Liam is growing up with lesbian parents so he doesn't have a "Dad". We don't know anything about his father so we have no one to call there. We are visiting Hilary's folks so we are spending the day with Grandpa and we will call my father later to wish him a Happy Father's Day, but that is really the extent of it for us this year. The day does have me reflecting on my own first father. Someone named Ken who I will never have a chance to meet. I wonder how much like him I would have been? My eyes and my colouring are from his gene pool. What about my height, my laugh, my tone-deafness? Maybe one day I will find his other children, my 1/2 siblings and they will help to fill in the blanks. But I do wish all the Father's our there a Happy Father's Day! Liam managed to fall on the ferry yesterday and gash open the corner of his eye and ended up with a really nice swollen shiner. Good thing is we aren't flying home for another week so hopefully it will be healed up before we have to go through security. We are vacationing on the Sunshine Coast of western Canada. It's a deceitful name as there has not been much sunshine yet! But like most vacationers, we suited it up and headed to the beach. It was much too cold to swim so we dug for treasure and built sandcastles. The only down side is that Liam has become insanely afraid of crabs. These are by no means the market size crabs that end up on your plate! If you weren't looking closely you would never see them at all. Now every time we go down to the beach (which just happens to be about 50 feet from Granny and Grandpa's back door) we have to pinky-swear to Liam that the crabs WILL NOT HURT HIM. As you can see they could surely (insert eye rolling here) do a lot of damage! Even if the sun were to make an appearance and warm things up, I don't think we will be getting Liam swimming in the Pacific any time soon. Lori who writes for Open Adoption Examiner has organized another book tour. This time we read Life Givers by James Gritter. Life Givers examines the seemingly simple question "Who are birthparents" and goes on to explore the birthparent experience in open adoption. It was an excellent book and one that I will be recommending as a must-read for anyone touched by adoption. The book tour offers us the chance to ask other readers questions on the book and then to go to their blogs to engage in discussions with them on their answers. So read on to see the 3 questions that I have answered and then follow the link at the end to find all the other participants. Did reading Life Givers give you any insight into what your own birthparents may have gone through? How will this affect your relationship with them? I read this book with my 2 different adoptive views –adoptive parent and adoptee - clashing around for attention. I didn’t have an open adoption with my birthparents, in fact I didn’t meet my birthmother until I was 30 and have never met anyone on my father’s side. And since reunion my mother and I have not had a very close relationship. Reading through Life Givers, my adoptee side had several moments of jealousy. I felt robbed of what I could have had – no secrets, no mysteries, no awkward reunion. But the flip side was that I also realized a lot of what Iris, my birthmother may have felt. The chapter “Circumstances of Necessity” really helped me to have a bit of insight into what must have seemed like an impossible decision for Iris. Unmarried and already a single mother in the late 1960’s, Iris saw no option but to place me for adoption. I’ve always had the benefit of looking back, but also looking back with different social awareness. Single motherhood was not something that was shunned by the time I was growing up. So it’s always been difficult for me to fully understand why she didn’t at least try. But reading Gritter’s definitions of “Convergence of Circumstances – Untimely pregnancies, awkward pregnancies and unsupported pregnancies made me stop and think about what Iris was truly faced with. And I think that this will affect my relationship with her. I can see her more as a woman in distress who made the best choice that she could rather than seeing her as someone who took the easy way out. What are you taking away from your reading of Life Givers and applying to your own open adoption experience? …we must at minimum provide her the opportunity to fully explain her disengagement in writing or better yet, on video tape. …we cannot lightly give up on the prospect of birthparent involvement. And that is what I felt I have done. Lightly given up. Because I felt that it was not my place to push “K” but more importantly because I did not want to cause “K” any more pain. But I need to realize that no matter what I do, “K” has to own her own grief and manage it herself. I would love to help her and support her through that, but we are not there right now. I have to be there for Liam. I am his champion in this and his needs (for me) need to come first. So my plan is to write to her and let her know why it is important for Liam that she be a part of his life. And while I can’t force her to come forward or be involved, I will keep the door WIDE open and a hand extended to welcome her whenever she is able. How do adoptive parents best accomplish the possibly counterintuitive goals of 1) respecting the birthparents' right to define their role in the lives of their birthchildren (how often, in what way, the relationship is maintained) and 2) nurture the expectation that birthparents will maintain lifelong involvement? This is such a tough question. It ties in with the previous question I answered about what I am taking away from my reading of Life Givers. One of the reasons that I have backed off on trying get “K” to be a part of our lives was out of respect for her, since it seemed that she was choosing to close the adoption by no longer replying to us. I worried about the pain that I was causing her, that my reaching out to her was too hard for her or that I was causing her additional discomfort or despair. But then I realized all the assumptions I was making. I am applying what I think my reactions would be if I were in her situation. I am not giving her the chance to explain or define what she wants her role to be. So I’m not respecting her choice as I don't know what her choice is. 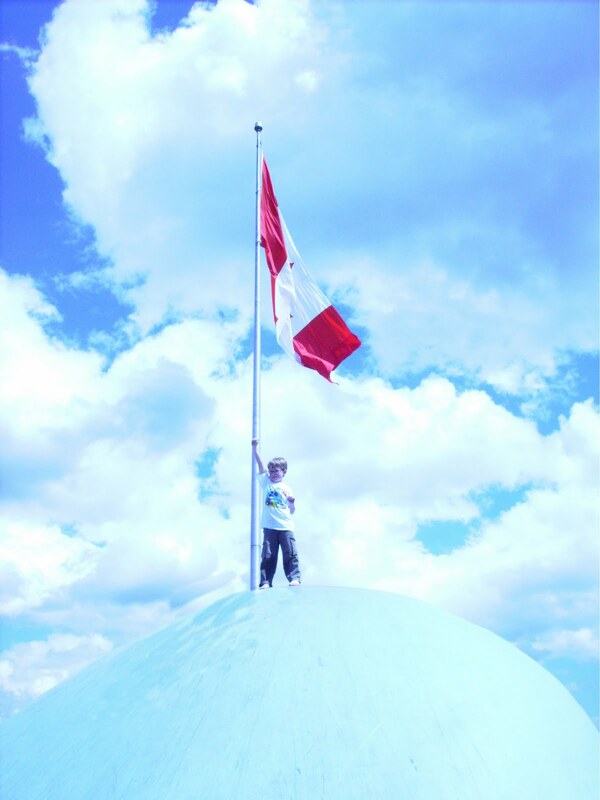 Liam, even at 7, has an expectation that "K" will be part of his life - forever. He hasn't asked the hard questions yet about why we don't visit or why we don't hear from her, but I'm sure they aren't far off. He does frequently talk about wanting to meet his siblings and it does cause him some distress that he doesn't know them. So for Liam sake I will try to balance respecting "K"'s choice while nurturing Liam's expectation that she be a part of his family. I don't have the magic answer of how to balance that, but keeping doors open, being respectful and listening to everyone's needs are the important first steps that I'm going to take. To continue to the next leg of this book tour, please visit the main list at The Open Adoption Examiner. And then of course, since it's the last week of school, they are holding a birthday celebration for all kids born in the summer, which includes Liam. So I thought, Hey! I've been wanting to make cake pops for awhile, and it seems pretty easy, so let's do it! Turns out it wasn't so easy, and like most things, they never turn out as nice as the pictures you find. But.. they still taste yummy! And now I think I have satisfied my crafting urges for quite awhile! Tune in tomorrow to see the finished products! It was only a matter of time. After a test run with a friend, and then again this past Saturday on his own, Liam walked to school all by himself today. I did not follow him. The crossing guard knew that he would be doing this today, as did his teacher. They were both on the lookout to make sure he arrived. And he did! Apparently proud as punch, telling everyone at school how he had just walked there on his own. And I only cried a little bit as he faded from site up the street. 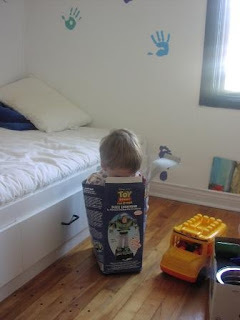 Back then he fit in the box that Buzz came in. 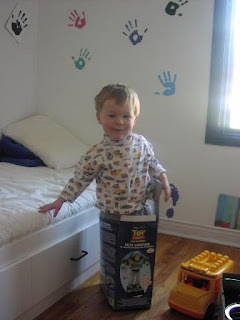 He loved to hide in it and jump out shouting "YOU ARE A TOY!" 13 days and counting till we get to meet Ken, Peas in a Pod and Lots-O'-Huggin' Bear. We can't wait! Thanks to Support for Special Needs and Cinda B for offering this great prize just for joining Support for Special Needs. They are a great new community that is just getting started and has lots of support and experience to offer no matter what your connection to the special needs world may be. So go check them out and join into some of the great discussions on the go. Publish your response during the next two weeks--linking back here so your readers can browse other participating blogs--and leave a link to your post in the comments. Imagine your child as an adult describing their open adoption experience. What do you hope they will be able to say about you? How did you view their other parents? In what ways did you support their relationship with them? One note from Heather: "I deliberately avoided asking you to imagine how your grown child feels about their open adoption experience. Adoptees of all ages regularly report having more than enough people (i.e. any) telling them how they should feel about adoption. This is an exercise in thinking about our actions and choices from another's perspective." I hope that Liam will recognize that we tried. That we had his interests at heart and that we wanted to do what we could for him. That even though we couldn't force his mom to have an open adoption with him that we kept the door open for her. I hope that he can look back and say that he could come to us whenever he wanted to and talk to us about adoption. That is was never a topic that he felt he had to tiptoe around. I hope that he knows that we were always honest with him and told him everything we could and that we kept everything that might one day be important to him or help him find/reunite with his mom. I hope that he knows that he is loved. By us, by "K", by everyone that falls into our definition of family.